This double sided 14K yellow gold Celtic necklace features a white gold tree of life in the center that is enhanced with Trinity knot leaves and a puffy dimensional design. Please note that the reverse side of this Celtic necklace is entirely yellow gold. 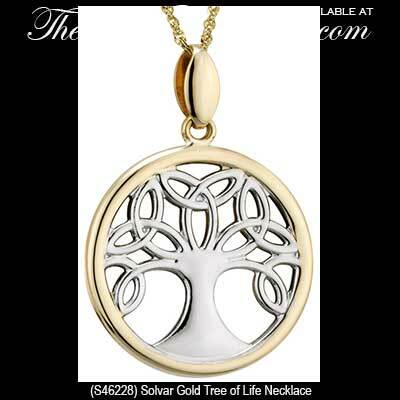 The lightweight Tree of Life pendant measures 7/8” wide x 1 1/4" tall, including the jump ring and the chain bail, and it includes an 18” long 14K yellow gold chain. 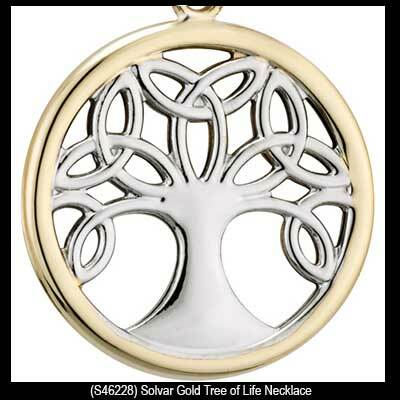 This Irish pendant is made in Ireland by Solvar Jewelry and it is gift boxed with Celtic knot and Tree of Life history cards, complements of The Irish Gift House. Tree of Life earrings are a puffed design that is cast in two tone 14K gold; they are enhanced with Trinity knot leaves. Sterling silver Tree of Life earrings feature gold Trinity knot leaves along with diamond fruit.